The Justin robot could help Ford officials boost communications abilities in cars. Image uploaded Aug. 26, 2013. Robots designed for space applications could help the Ford Motor Company build a better car. A three-year study kicked off by the Ford engineers and scientists at St. Petersburg Polytechnic University in Russia will examine the ways that robots on the ground and in space send and receive messages. 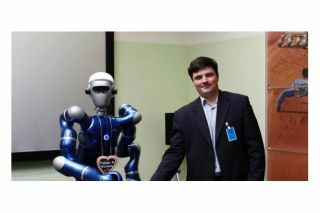 By understanding the European-built humanoid Justin robot, the EUROBOT Ground Prototype and NASA's Robonaut R2's communications systems, engineers could develop more fail-safe methods for vehicles to send in data about accidents and emergency situations. "The development of connected vehicle communications has the potential to reduce traffic accidents and ease congestion by enabling vehicles to communicate with each other, and to communicate with buildings, traffic lights, the cloud and other systems to deliver a message or detect and respond to imminent collision warnings," Ford officials wrote in a news release. For example, it's possible that a vehicle's cloud communication system could be damaged during an accident, but by building in redundant communication options — like those on the International Space Station — a car still might be able to send important information to rescue workers through different means. The information might eventually be routed through a vehicle-to-vehicle network, Ford officials wrote. "The research of fallback options and robust message networks is important," Oleg Gusikhin, technical leader in systems analytics for Ford, said in a statement. "If one network is down, alternatives need to be identified and strengthened to reliably propagate messages between networks." Communications networks could also be bolstered by the research according to Ford officials. Learning about the telematics — the transmission of information across long distances — used by the International Space Station might allow engineers to blend various networks together, ensuring the best signal strength for important messages, Ford officials wrote. "We are analyzing the data to research which networks are the most robust and reliable for certain types of messages, as well as fallback options if networks were to fail in a particular scenario," Gusikhin said. "In a crash, for example, a vehicle could have the option to communicate an emergency though a DSRC, LTE or a mesh network based on the type of signal, speed and robustness required to reach emergency responders as quickly as possible."